Ethiopian duo Asefa Bekele and Mesera Dubiso take the overall crowns in Dublin. 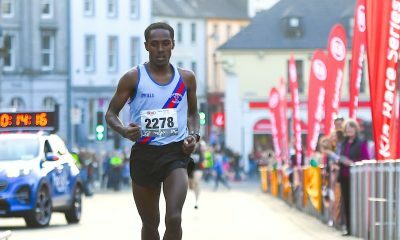 Ethiopia’s Asefa Bekele claimed victory in the men’s race at the SSE Airtricity Dublin Marathon on Sunday (October 28), while Mick Clohisey won the national title on his first outing in the Irish capital marathon. Bekele, who finished third in 2017 and 2015, clocked 2:13:24 to take the win finishing nine seconds ahead of South Africa’s David Manja who crossed the line in 2:13:33. Kenya’s Joe Kiptoo completed the men’s podium in 2:13:42 ahead of Ethiopia’ss Benard Rotich and American Seth Totten. Raheny Shamrock’s Clohisey was the first Irish male athlete across the finish line clocking 2:15:58 in sixth place overall. 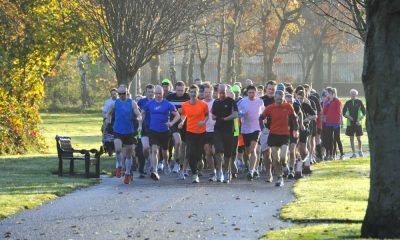 It was the Olympian’s first appearance at the Dublin Marathon and comes after his personal best 2:14:55 at the Seville Marathon in February. 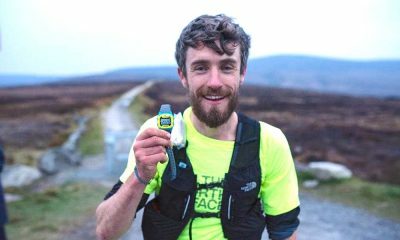 Great Britain’s Josh Griffiths finished seventh in 2:16:09, while 2017 Irish national champion Gary O’Halon finished in 10th place (2:17:11) followed by Clonliffe Harriers clubmate Sergiu Ciobanu in 12th (2:17:27), with the duo completing the Irish national championships podium. 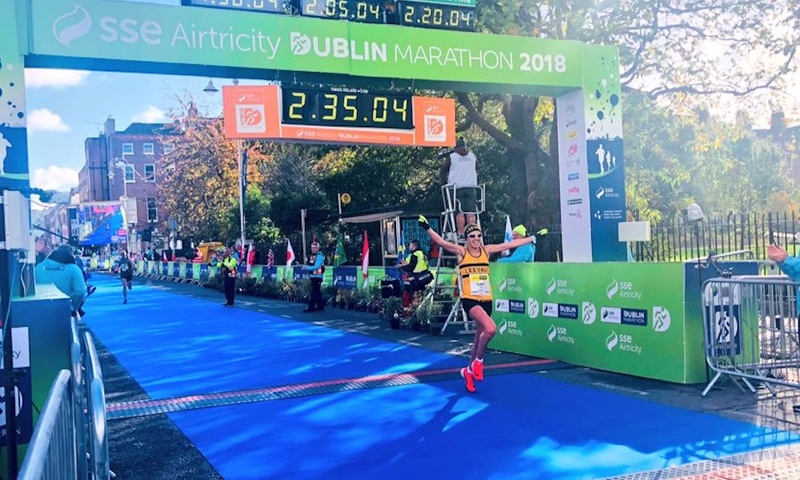 Mesera Dubiso completed an Ethiopian double in Dublin winning the women’s race in a time of 2:33:49. Dubiso finished over 30 seconds ahead of compatriot Motu Gedefa, while Irish Olympian Lizzie Lee secured a top three spot after crossing the line in 2:35:05. Cork native Lee, who has a personal best of 2:32.51, has shown good form this season, setting a new personal best of 73:19 at the World Half Marathon Championships in March before winning the Women’s Mini Marathon for the first time in June. Leevale’s Lee won women’s Irish national championships, with Letterkenny’s Caitriona Jennings second (sixth overall) in 2:41:17. 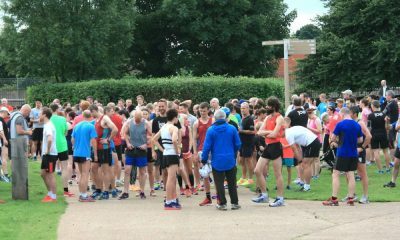 Jill Hodgins ensured Leevale AC had a second athlete on the podium finishing 10th overall in 2:47:53. 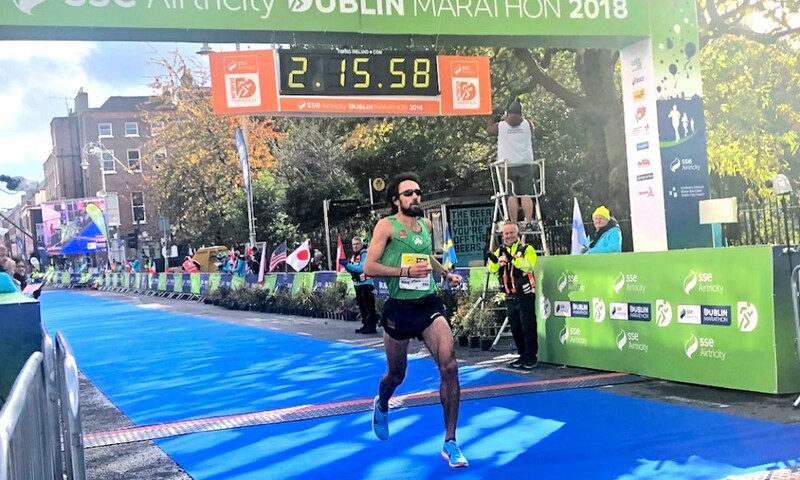 Other Irish results in the men’s race include Raheny’s Mark Kirwan in 12th place in a time of 2:17:37, Clonliffe’s David Flynn clocked 2:19:49 to finish 15th, while David Mansfield ran 2:20:15 and Star of the Sea’s Eoin Callaghan posted 2:20:26. In the women’s race, additional results include Galway City Harriers Jane Ann Meehan in 11th place in 2:50:30, with Adrianna Melia 14th in 2:52:20 ahead of St. Finbarrs Sorcha Kearney in 2:52:28. Great Britain’s Johnboy Smith won the wheelchair race in 1:36:12 ahead of four-time champion Patrick Monahan. Please note finishing times are unofficial and subject to change.